In addition to the court church with its magnificent interior, the Würzburg Residence has a total of 40 period rooms open to the public, with a rich array of furniture, tapestries, paintings and other art treasures of the 18th century. The tour through the Residence starts on the ground floor with the vestibule and and the Garden Hall goes via the famous staircase on to the upper floor where the other rooms are. The court church is accessible through a separate entrance on the southern front yard. 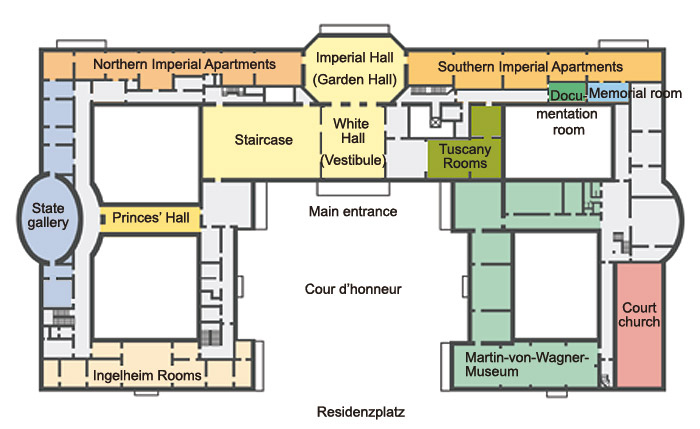 Please click on a room in the plan or in the legend for a view of the interior.